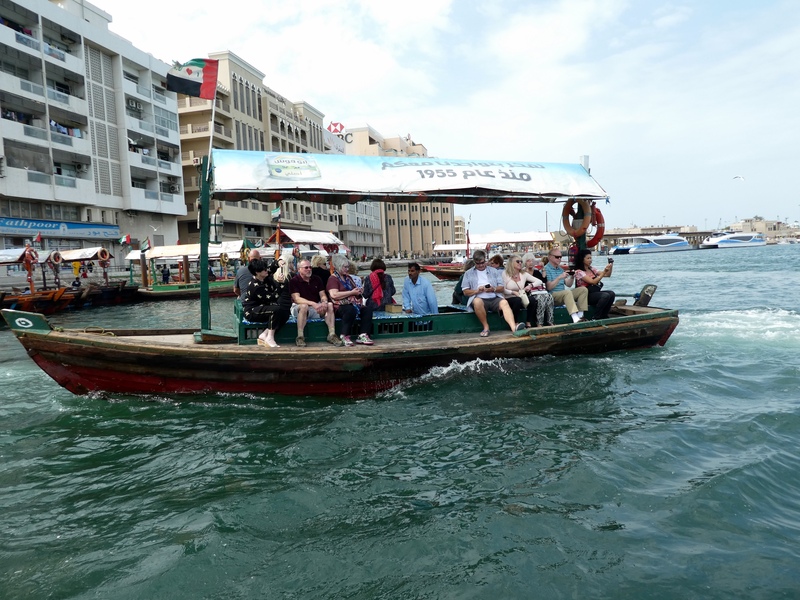 We will ride in a dhow across Dubai Creek and then visit the souks. We think that means shopping and maybe a little snacking. 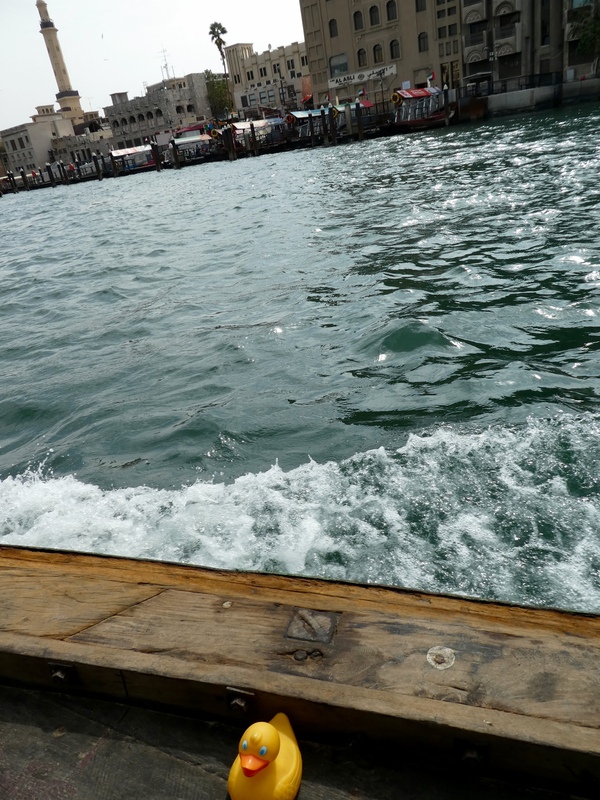 Let’s find the dhows, the traditional boats used to cross the creek. Those tourists are crossing Dubai Creek and will dock near the souks. We are on the dhow. Mom has to be careful that I don’t fall into Dubai Creek. This is not the time to go swimming. 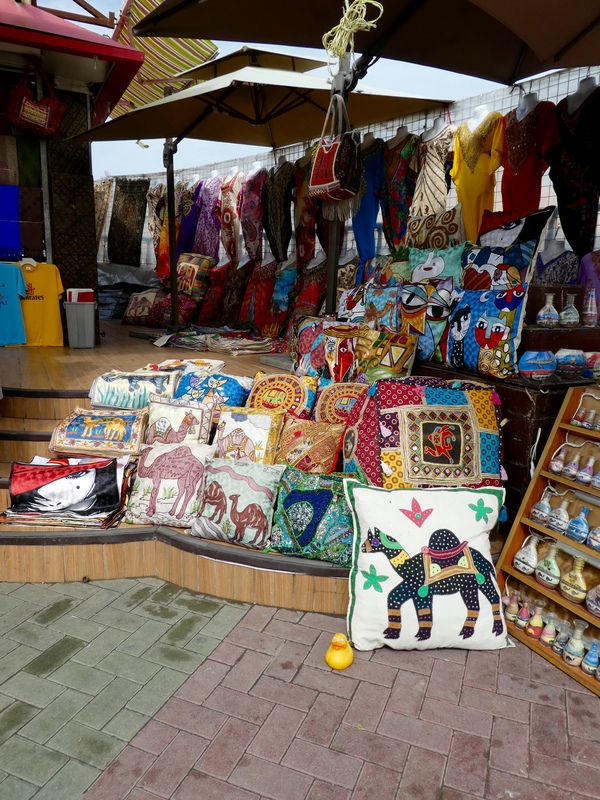 Arriving on the other side of Dubai Creek, we are greeted with wonderful souks. Doesn’t this look like a perfect place to browse? It was great for us. And there is so much more. We love this place. And the spices. The aroma was enticing and exciting. We did some browsing and buying here. Mom doesn’t cook much, so she didn’t get spices, but we purchased and enjoyed small pieces of chocolate candy made with camel milk. Yum! Also dates with almonds coated with this same chocolate. And camel milk soap. They made unusual gifts for friends. Mom drinks lots of tea, so she purchased a blend of loose tea that the owner recommended. We liked it! The dried mangos were great snacks also. 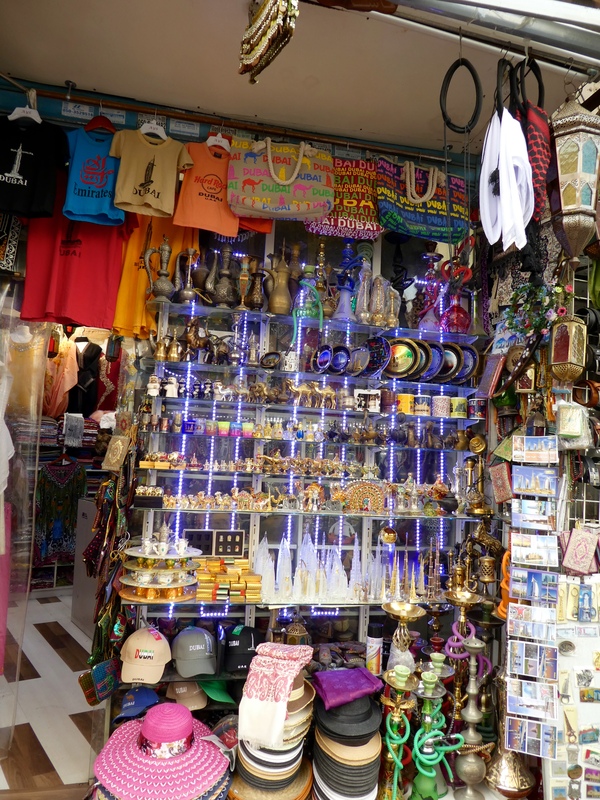 The aisles of the souk are rather narrow with stalls or booths on each side. There are so many things to see here. 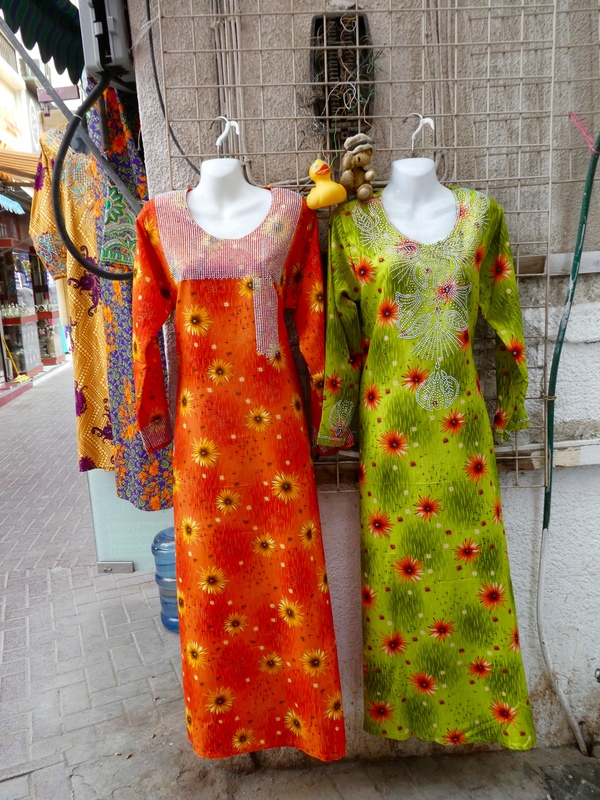 Wandering, we saw these colorful dresses. Don’t they seem cheerful. They may be for special occasions as we never saw the women wear bright colors. 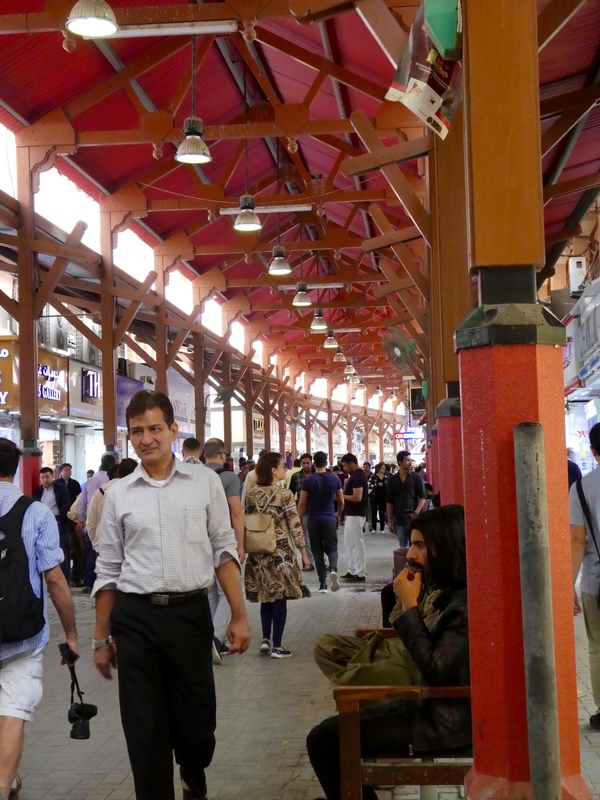 Now, the souk we have all been waiting to see. 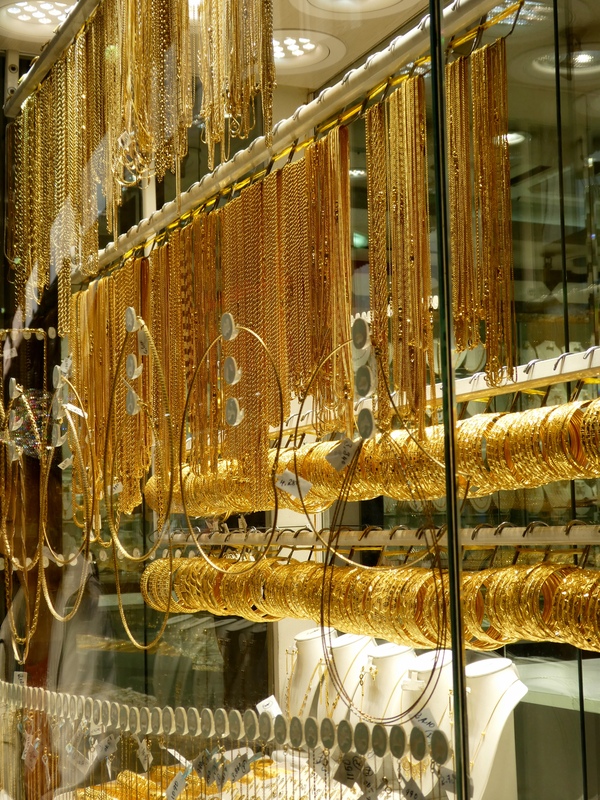 The gold souk. 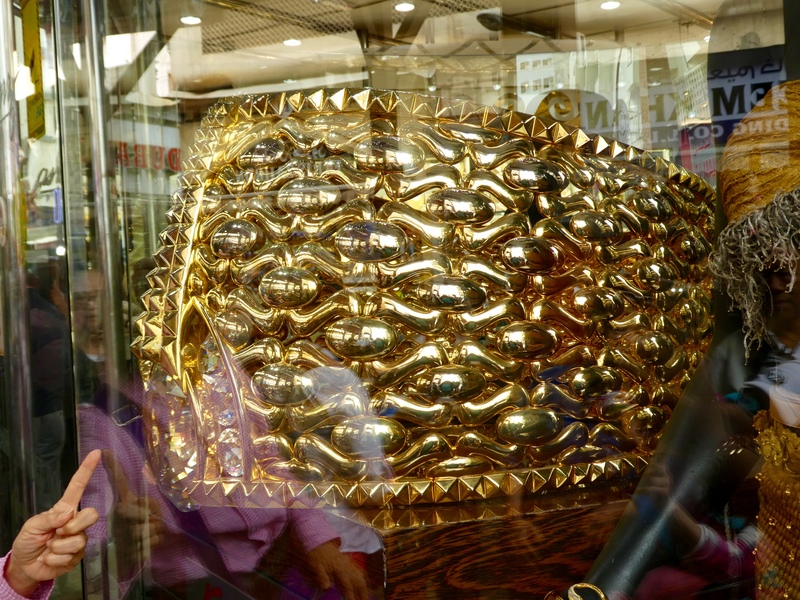 Here in the window of Kanz store, is the world’s largest gold ring. Next to the ring, in the window is the certificate from Guinness World Records. This ring, Najmat Taiba (Star of Taiba), has 5.17 kg precious stones sitting on 58.686 kg of 21 carat gold. The total weight of the world’s largest ring is 63.856 kg. And do you know that the ring is still there. Our moms did not try to purchase and bring it home. 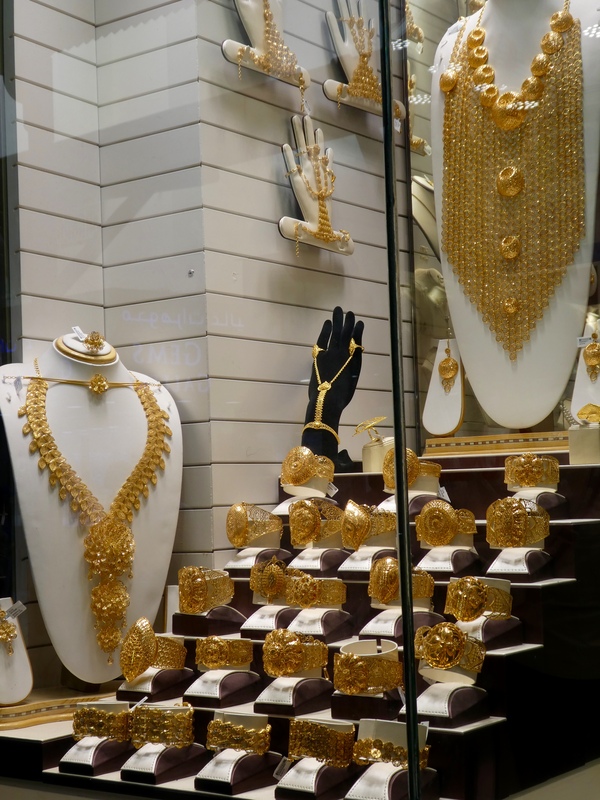 The gold souk is newer than the other souks. 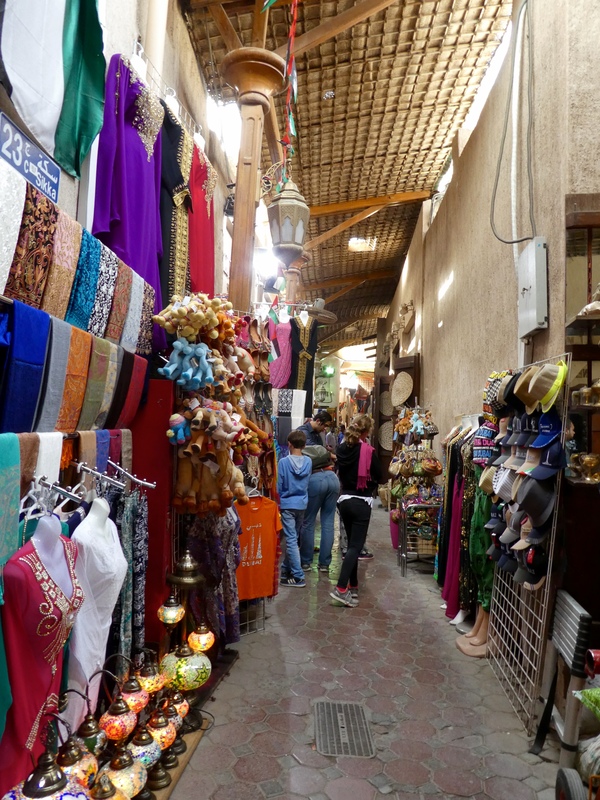 This souk is several blocks long, on a pedestrian street. Much of the walkway is covered, again for comfort in the hot summer months. This window shows so many gold bracelets and gold chains. Aren’t they beautiful? We, Zeb the Duck and Chanel the Bear, have never seen gold necklaces like these. They are beautiful. Could they be used for protection from arrows or spears? We are fascinated by these necklaces. 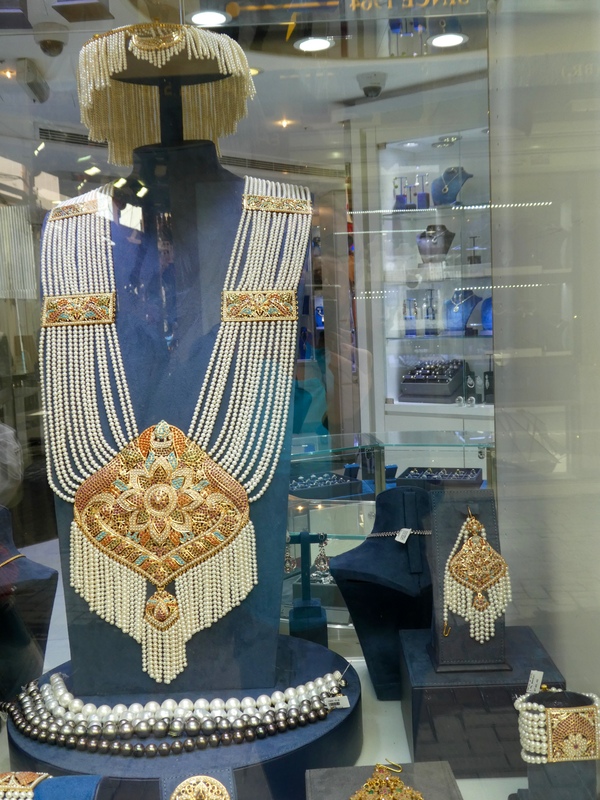 And, here is a necklace of pearls and gold. This is a great opportunity for a duck, a bear and human moms to see gold necklaces like they have never seen before. Isn’t Dubai great? Again, all this shopping and looking makes us a little tired, a little warm, and a little hungry. Following directions from people on the street, look where we went. We were searching for a local ice cream store, but this is where we were directed. And we love this, too. Shopping still makes us hungry. We love Baskin Robbins!! 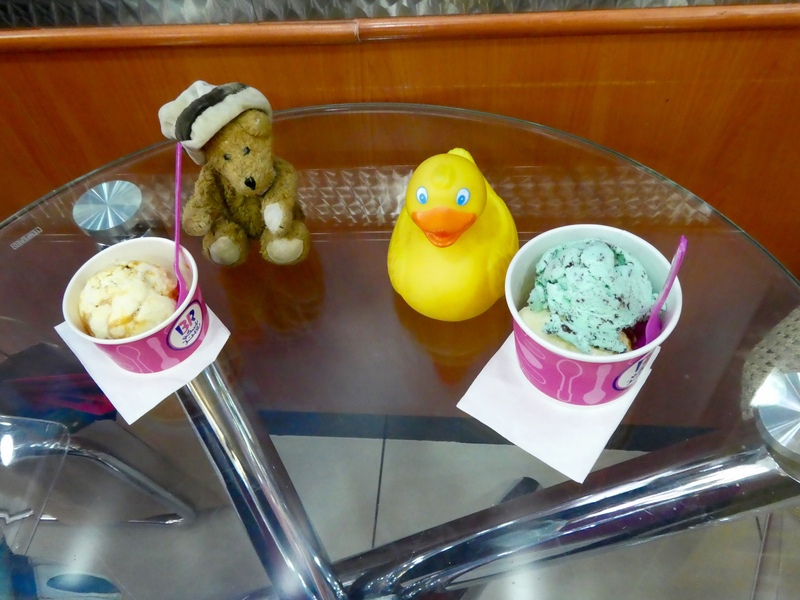 We may never be able to eat at Baskin Robbins again without thinking of Dubai. While eating, the humans talked about their purchases. They each bought about the same things at the spice store. 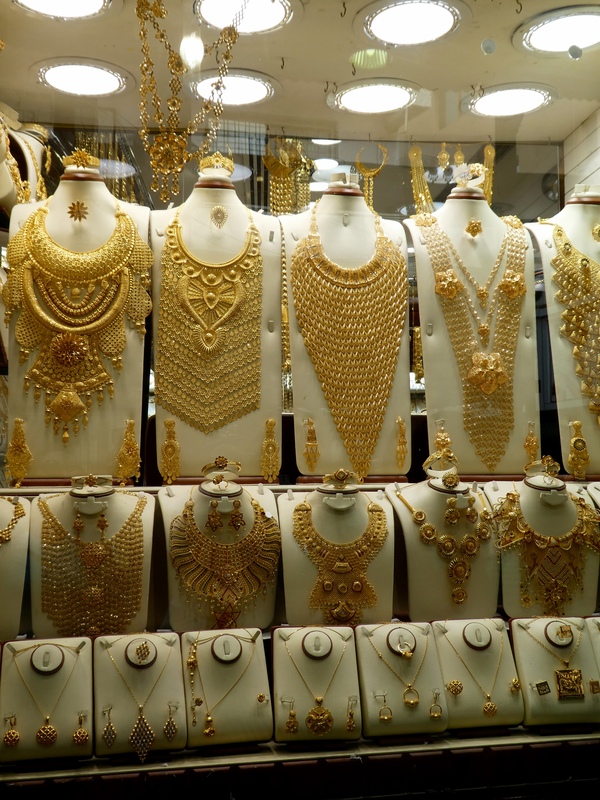 My mom also shopped at the gold souk. We got a solid gold bracelet for Soapy Smith Duck’s mom, and a necklace of multiple gold chains for my mom. Chanel’s mom later bought gold bracelets for her granddaughters, and one for herself, from a store in our hotel. But no gold for Zeb and no gold for Chanel. 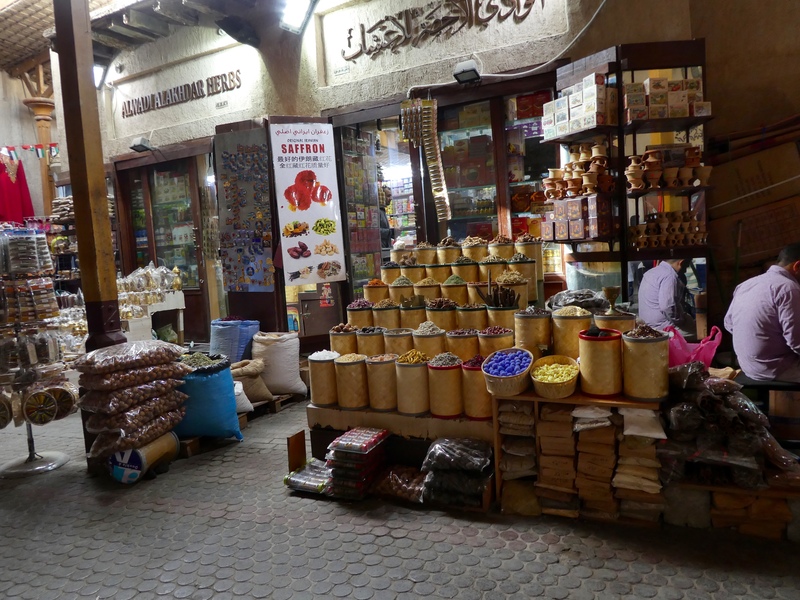 This entry was posted in Dubai, Uncategorized, United Arab Emirates and tagged Baskin Robbins, Colorado Traveling Ducks, dhows, Dubai Creek, gold souk, souks, spices. Bookmark the permalink. Thanks. I would love to go back We really had a wonderful trip. Thanks for reading and commenting. Wow, that’s some creek! It’s huge. 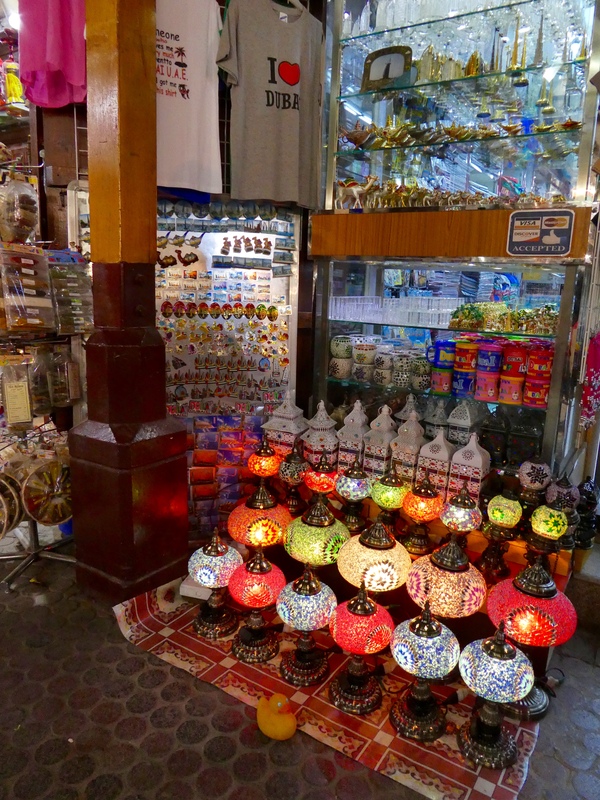 It would be easy to spend all day in those souks. Definitely easy but too expensive to spend much time in gold souk. Loved the spice and older souks!! Thanks for reading and commenting. Glad you tried the camel milk chocolates but sad you didn’t get a chance to try the camel milk ice cream. With the hot weather, it is quite appropriate. Please come back and try next time you’re around! We would love to return to Dubai. Trying camel milk ice cream is definitely on the list if we return. Thanks for reading and commenting.